Did you know that using a dog crate can actually calm your puppy? It's true, by giving your puppy a crate to rest or sleep in, you have given him a den-like environment that comes from a natural instinct that is inbreed in your puppy. In the wild they look for places that are "den-like" to sleep in. You'll notice that when you start shopping around for a kennel that there is one to fit just about every size of puppy dog. Whether you are looking for a kennel to transport your dog on the airlines or for potty training puppies, there's one out there just for you! It's important to buy a crate from a leading manufacturer so you can be assured that you will receive only a top quality dog kennel. Ok, so yes there are cheaper brands out there, but you will find that the cheaper kennel is very flimsy and will not take too much moving around or collapsing. If your budget allows, purchase the better brand so your kennel will last for many years. There are all sizes and styles of dog kennels specifically designed to fit any dog from the largest to the smallest canine. Now I would bet that you probably think of your home as your castle, your sanctuary, a safe place to be, a calming retreat, right?. Well, why not give your dog this same comfort by selecting the proper crate and showing your pet that he has his own little sanctuary... his crate. Crate training is an important part of your puppies life because there are many situations where kenneling your pet may become necessary. This is another reason for crate training puppies early in their life. Even if your pet lives mostly inside your home, don't underestimate the usefulness of a kennel. When traveling in a car, your pet will travel safer if he is confined in a dog crate and you will not be distracted by a jumping dog while driving. And in the event of an accident the dog crate will provide a certain level of protection and keep a scared dog from running away in a crazy situation. At some time in your puppies life he may have a medical condition where using a crate will be necessary. There might also be times when your veterinarian may recommend keeping your puppy confined so your pet's activity can be reduced due to recovery from surgery or some other condition that needs to be monitored. And then there are those social situations where kenneling is necessary. 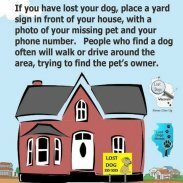 You may be having a party where you need to keep your puppy safe and out of trouble. Sometimes you might have a friend over who is fearful about dogs or in the worse case scenario you may have a dog that is aggressive to strangers. 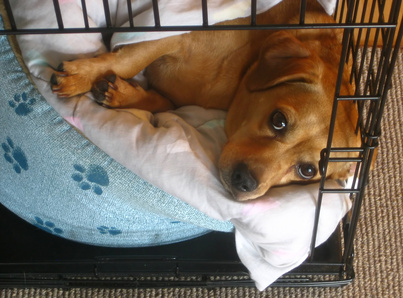 A dog that can stay quietly in a crate can make the situation easier and you a bit calmer too. This dog crate is a really good choice for potty training puppies. The Wire frame crates are made from heavy gauge wire or stainless steel on all six sides. This increases ventilation and visibility for your pet. The advantage of the wire dog crate is that it's collapsible, assembles and disassembles very quickly making it easy to take with you on trips or to store away. The Wire dog crate is easy to clean and has a tough rust-proof plastic pan which slides out for easy cleaning. Currently I'm using the Wire type crate and because it is a very open style, in the winter to create a more den like feel, I cover it with a blanket which also keeps my puppies warm. In the summer I keep a light weight sheet over half of it (to make sure there is enough air flow due to hot days or evenings) to create that den atmosphere. Now here's another type of wire crate that is especially useful for potty training puppies. These crates are designed with two access doors, one is located on the front side and the other is on the top of the crate. Having this type of access thru the top is especially useful when you need to contain a litter of puppies. You can open the top and pick up one puppy without the rest of the puppies dashing out the door. When selecting a wire crate consider the size of the wire, be sure your dogs paws won't fall through the bottom grid which could cause harm to your puppy. Check for any sharp edges. Check to make sure the door isn't spring loaded. These types of doors can be very dangerous to your puppy because they can snap shut on a paw, tail or neck. I don't recommend doors that shut on their own. Make sure that the door has to be manually opened and closed by you. Having doors in two different areas is wonderful because it gives you flexibility as to where you can place the dog crate in your home. Let's say you're placing the kennel in the living room but you need the door to open from the front, Bingo! Or when you move the dog crate to the bedroom you need the door to open from the side, Bingo again! I just love to have choices! Another type of crate used for potty training puppies are the Plastic Dog Kennels which are made of durable polypropylene with chrome plated steel doors, chrome-plated ventilation side panels, and a leak-proof bottom. They can be assembled without tools and go together in minutes. They are great for potty training puppies and the bottom half can be used alone as a pet bed down the road. Plastic dog kennels offer a more enclosed type of feeling and privacy while maintaining that den-like feel. Most of these crates have separate tops and bottoms that are assembled and secured with nuts and screws. The front of the crate frame has a wire door with a manual locking mechanism. They are easy to take apart for cleaning and storage. 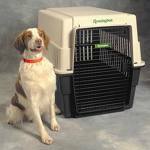 This type of crate is a good choice for transporting your pet (size permitting of course) to the veterinarian and is the only crate approved for air travel. if you no longer need it? Let's not forget our local animal rescues and shelters. If your dog has outgrown his dog crate or your dog simply isn't using it, consider donating your dog crate to a local animal shelter or dog rescue. They are always in need of supplies and will gladly accept your donation. Do remember this though, many adult dogs still love the security a crate provides them even if the door is never closed. Remember, this is "their" sanctuary so don't take a crate away from them if they still use it just because you might think it is an inconvenience to you! It would be like taking your home away from you.